Wipf & Stock Publishers, 9781498261852, 82pp. 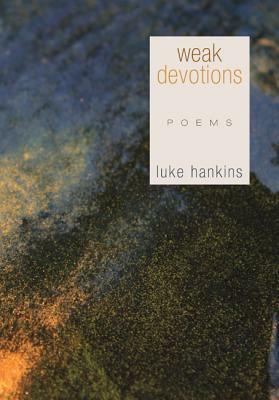 In Weak Devotions, his first poetry collection, Luke Hankins engages with great honesty the difficulties and uncertainties inherent in the spiritual life. Far from seeking mere ""self-expression,"" Hankins has honed these explorations into tightly knit meditations and monologues that will resonate with the deepest questions and longings of readers of all backgrounds. ""Luke Hankins's poetry shimmers with intellect and craft. However, what is most surprising about it, especially in our time, is that it wrestles with the issues Donne, Herbert, Hopkins, Vassar Miller, and countless others also found worthy of their most impassioned work . . . But one need not be religious to be moved by poetry as finely wrought as is found in his brilliant title poem and elsewhere in this book."" -John Wood ""There is great compassion in these poems, most especially for the vicissitudes of childhood, when the mystery of life is first unfolding. But Hankins understands that 'there are few words left sufficient to this world' to explain or console or lift up as praise, and that even the loveliest poem may prove a weak devotion. Still, Hankins does not give in to uncertainty or despair. Rather, in masterfully wrought poems, he exhorts us to 'abandon ideas and concepts of beauty' and 'be part of it, ' a natural and blessed part of life's great dance. In the beautiful poem 'Wisteria, ' the poet convinces us that it is in fact possible to give oneself over to the mysterious 'sweetening sun, ' like a vine-wrapped tree that becomes 'what rises through it.' Such brave surrender is, I think, what gives these heartfelt poems their clarity, power, and grace."" -Richard Jones Luke Hankins is Senior Editor at Asheville Poetry Review, where he has served on staff since 2006. He is the editor of an anthology of poems titled Poems of Devotion: An Anthology of Recent Poets, forthcoming from Wipf & Stock (2012). His poems, essays, and translations have appeared in numerous publications.